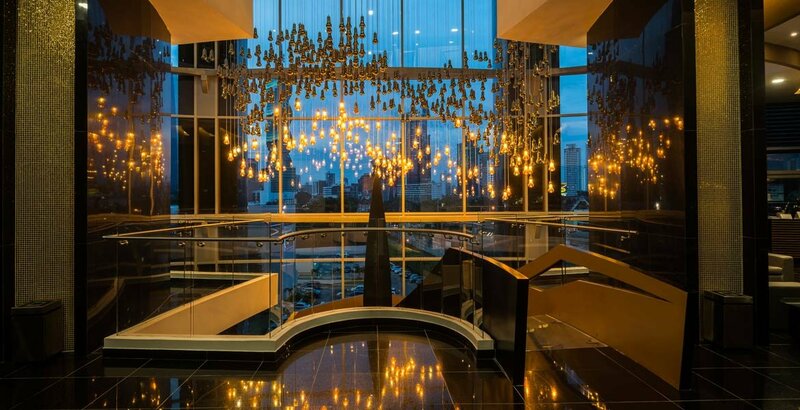 Hotel Las Américas Golden Tower Panamá had its official opening this week in Panama City during an inauguration event attended by Panamanian President Juan Carlos Varela and some 500 guests. The ceremony, formalizing the property’s soft launch in August, was hosted by Colombian investors Inversiones Talarame, which is making its first foray into the international hotel world with this location in Panama City. The $70 million USD Hotel Las Américas Golden Tower Panamá on Avenida Balboa was designed by Uruguayan architect Carlos Ott, who is best known for his Opéra Bastille in Paris and has developed other buildings in Miami and Dubai. The 30-story property features 285 luxury rooms and suites in addition to seven meeting rooms to host banquets and conferences. It also includes multiple restaurants and bars as well as a spa, indoor pool, gym, and business center. Inversiones Talarame founding partner Alberto Araújo Merlano and CEO Andrés Felipe Ordóñez Caicedo also attended the ceremony this week. «We chose Panama City because of its strategic geographical location, its enormous commercial potential, and the consistent growth of its economy and business travelers,» said Andrés Felipe Ordoñez.